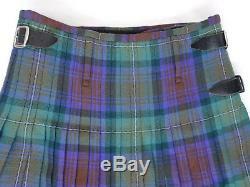 This Scottish'Isle of Skye' tartan medium - heavy weight, 100% Wool (18oz), 8 yard Kilt, has been worn and is in excellent condition. 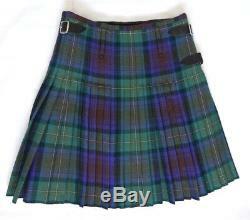 This Kilt will fit a size 36" - 38" comfortably around the stomach (belly button area), and has a drop of 25 inches. 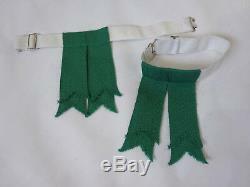 There is a leather buckle on the left side, and another two on the right side for extra adjustment. 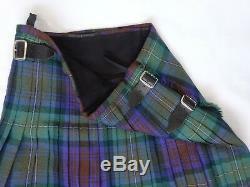 The kilt has 2 belt loops at the back and 28 x 4 sharp deep knife pleats, pleated to the set, and is lined inside in the traditional manner. 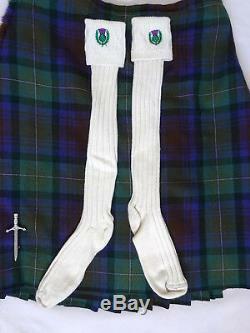 Comes with a brand new 3¾ " Scottish Claymore Style Kilt Pin , a pair of 6" green Sock Flashes and a pair of cream Kilt Socks (7 - 9UK). 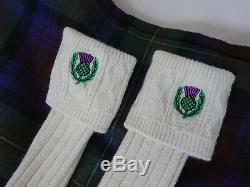 View My Other Highland Wear Items For Sale. 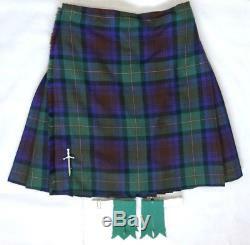 To ensure this Kilt is the right size for you, measure 2 inches above the navel (belly button), this is where the kilt sits when worn. The other important measurement is the length. Whilst kneeling on the floor and keeping your back upright. 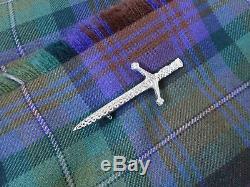 Look straight ahead then measure about 1 inch above your navel to the floor. This will give you the correct length, which is mid-knee, it is always helpful for someone else to take this measurement! ENVIRONMENT: Please be aware that in some cases items may arrive wrapped in recycled packaging, i.
E I will try to re-use padded envelopes and mailing bags whenever practicable. 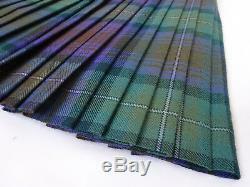 The item "Scottish Isle of Skye Tartan 8 Yard 100% Wool Kilt, Pin, Flashes & Socks 36/38" is in sale since Friday, February 8, 2019. This item is in the category "Clothes, Shoes & Accessories\World & Traditional Clothing\Europe\Other European Clothing". 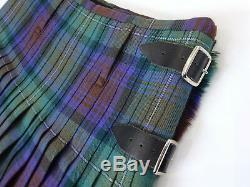 The seller is "kaela2006" and is located in Fife, Scotland.